It’s not that you expect anything in particular from this particular book. You’re the sort of person who, on principle, no longer expects anything of anything. There are plenty, younger than you or less young, who live in the expectation of extraordinary experiences: from books, from people, from journeys, from events, from what tomorrow has in store. But not you. You know that the best you can expect is to avoid the worst. This is the conclusion you have reached, in your personal life and also in general matters, even international affairs. What about books? Well, precisely because you have denied it in every other field, you believe you may still grant yourself legitimately this youthful pleasure of expectation in a carefully circumscribed area like the field of books, where you can be lucky or unlucky, but the risk of disappointment isn’t serious. In other words, it’s better for you to restrain your impatience and wait to open the book at home. Now. Yes, you are in your room, calm; you open the book to page one, no, to the last page, first you want to see how long it is. It’s not too long, fortunately. Long novels written today are perhaps a contradiction: the dimension of time has been shattered, we cannot love or think except in fragments of time each of which goes off along its own trajectory and immediately disappears. We can rediscover the continuity of time only in the novels of that period when time no longer seemed stopped and did not yet seem to have exploded, a period that lasted no more than a hundred years. You turn the book over in your hands, you scan the sentences on the back of the jacket, generic phrases that don’t say a great deal…Of course, this circling of the book, too, this reading around it before reading inside it, is a part of the pleasure in a new book, but like all preliminary pleasures, it has its optimal duration if you want it to serve as a thrust toward the more substantial pleasure of the consummation of the act, namely the reading of the book. The novel begins in a railway station, a locomotive huffs, steam from a piston covers the opening of the chapter, a cloud of smoke hides part of the first paragraph. The espresso machines in station cafés boast their kinship with the locomotives, the espresso machines of yesterday and today with the locomotives and steam engines of today and yesterday. Watch out: it is surely a method of involving you gradually, capturing you in the story before you realize it—a trap. It is obvious that I am a subordinate, I do not seem the sort of man who is traveling for personal reasons or who is in business for himself; you would say, on the contrary, that I am doing a job, a pawn in a very complicated game, a little cog in a huge gear, so little that it should not even be seen: in fact, it was established that I would go through here without leaving any traces; and instead, every minute I spend here I am leaving more traces. I leave traces if I do not speak with anyone, since I stick out as a man who won’t open his mouth; I leave traces if I speak with someone because every word spoken is a word that remains and can crop up again later, with quotation marks or without. I am not at all the sort of person who attracts attention, I am an anonymous presence against an even more anonymous background. If you, reader, couldn’t help picking me out among the people getting off the train and continued following me in my to-and-fro-ing between bar and telephone, this is simply because I am called “I” and this is the only thing you know about me, but this alone is reason enough for you to invest a part of yourself in the stranger “I.” Just as the author, since he has no intention of telling about himself, decided to call the character “I” as if to conceal him, not having to name him or describe him, because any other name or attribute would define him more than this stark pronoun; still, by the very fact of writing “I” the author feels driven to put into this “I” a bit of himself, of what he feels or imagines he feels. For the moment my external behavior is that of a traveler who has missed a connection, a situation that is part of everyone’s experience. “I”- a character whose inner history you know nothing about, as you know nothing about the contents of that suitcase he is so anxious to be rid of. Getting rid of the suitcase was to be the first condition for re-establishing the previous situation: previous to everything that happened afterward. This is what I mean when I say I would like to swim against the stream of time: I would like to erase the consequences of certain events and restore an initial condition. But every moment of my life brings with it an accumulation of new facts, and each of these new facts brings with it its consequences; so the more I seek to return to the zero moment from which I set out, the further I move away from it: though all my actions are bent on erasing the consequences of previous actions and though I manage to achieve appreciable results in this erasure, enough to open my heart to hopes of immediate relief, I must, however, bear in mind that my every move to erase previous events provokes a rain of new events, which complicate the situation worse than before and which I erase previous events provokes a rain of new events, which complicate the situation worse than before and which I will then, in their turn, have to try to erase. Therefore I must calculate carefully every move so as to achieve the maximum of erasure with the minimum of recomplication. A man whom I do not know was to meet me as soon as I got off the train, if everything hadn’t gone wrong. A man with a suitcase on wheels, exactly like mine, empty. The two suitcases would bump into each other as if accidentally in the bustle of travelers on the platform, between one train and another. An event that can happen by chance, but there would have been a password that that man would have said to me, a comment on the headline of the newspaper sticking out of my pocket, on the results of the horse races. “Ah, Zeno of Elea came in first!” And at the same time we would disentangle our suitcases, shifting the metal poles, perhaps also exchanging some remarks about horses, forecasts, odds; and we would then go off toward different trains, each pushing his suitcase in his own direction. No one would have noticed, but I would have been left with the other man’s suitcase and he would have taken away mine. In an existence like mine forecasts could not be made: I never know what could happen to me in the next half hour, I can’t imagine a life all made up of minimal alternatives, carefully circumscribed, on which bets can be made: either this or that. I say; or, rather, it isn’t clear whether I really say it or would like to say it or whether the author interprets in this way the half sentence I am muttering. You are quick to catch the author’s intentions and nothing escapes you. But, at the same time, you also feel a certain dismay; just when you were beginning to grow truly interested, at this very point the author feels called upon to display one of those virtuoso tricks so customary in modern writing, repeating a paragraph word for word. Did you say paragraph? Why, it’s a whole page; you make the comparison, he hasn’t changed even a comma. And as you continue, what develops? Nothing: the narration is repeated, identical to the pages you have read! You fling the book on the floor, you would hurl it out of the window, even out of the closed window, through the slats of the Venetian blinds; let them shred its incongruous quires, let sentences, words, morphemes, phonemes gush forth, beyond recomposition into discourse; through the panes, and if they are of unbreakable glass so much the better, hurl the book and reduce it to photons, undulatory vibrations, polarized spectra; through the wall, let the book crumble into molecules and atoms passing between atom and atom of the reinforced concrete, breaking up into electrons, neutrons, neutrinos, elementary particles more and more minute; through the telephone wires, let it be reduced to electronic impulses, into flow of information, shaken by redundancies and noises, and let it be degraded into a swirling entropy. You would like to throw it out of the house, out of the block, beyond the neighborhood, beyond the city limits, beyond the state confines, beyond the regional administration, beyond the national community, beyond the Common Market, beyond Western culture, beyond the continental shelf, beyond the atmosphere, the biosphere, the stratosphere, the field of gravity, the solar system, the galaxy, the cumulus of galaxies, to succeed in hurling it beyond the point the galaxies have reached in their expansion, where space-time has not yet arrived, where it would be received by nonbeing, or, rather, the not-being which has never been and will never be, to be lost in the most absolutely guaranteed undeniable negativity. Merely what it deserves, neither more nor less. The next day, as soon as you have a free moment, you run to the bookshop, you enter, holding the book already opened, pointing your finger at a page, as if that alone were enough to make clear the general disarray. “You know what you sold me? . .. Look here.. .. Just when it was getting interesting…” The bookseller maintains his composure. “Ah, you, too? I’ve had several complaints already. And only this morning I received a form letter from the publisher. You see? 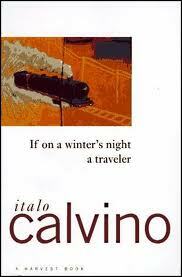 ‘In the distribution of the latest works on our list a part of the edition of the volume If on a winter’s night a traveler by Italo Calvino has proved defective and must be withdrawn from circulation. You cut your way through your reading as if through a dense forest. It is my relationship with my life, consisting of things never concluded and half erased, that the subject of seashells forces me to contemplate. which can only be lived, second by second, which cannot be recorded or remembered? the silent language to which all the words we believe we read refer. “Why? Would you want me to read in your books only what you’re convinced of?” “What you want would be a passive way of reading, escapist and regressive,” Lotaria said. She (Lotaria) explained to me that a suitably programmed computer can read a novel in a few minutes and record the list of all the words contained in the text, in order of frequency. The idea that Lotaria reads my books in this way creates some problems for me. Now, every time I write a word, I see it spun around by the electronic brain, ranked according to its frequency, next to other words whose identity I cannot know, and so I wonder how many times I have used it, I feel the whole responsibility of writing weigh on those isolated syllables, I try to imagine what conclusions can be drawn from the fact that I have used this word once or fifty times. Perhaps instead of a book I could write lists of words, in alphabetical order, an avalanche of isolated words which expresses that truth I still do not know, and from which the computer, reversing its program, could construct the book, my book. Because writing always means hiding something in such a way that it then is discovered. “Why have you come to see me, then?” I replied. “Go to that gentleman and ask him how things stand.” I began to suspect that between the Reader and Ludmil a there was a bond, and this was enough to make my voice take on a hostile tone. I have pondered my last conversation with that Reader. Perhaps his reading is so intense that it consumes all the substance of the novel at the start, so nothing remains for the rest. This happens to me in writing: for some time now, every novel I begin writing is exhausted shortly after the beginning, as if I had already said everything I have to say. I have had the idea of writing a novel composed only of beginnings of novels. The protagonist could be a Reader who is continually interrupted. The Reader buys the new novel A by the author Z. But it is a defective copy, he can’t go beyond the beginning…. He returns to the bookshop to have the volume exchanged… I could write it all in the second person: you, Reader … I could also introduce a young lady, the Other Reader, and a counterfeiter-translator, and an old writer who keeps a diary like this diary…. But I wouldn’t want the young lady Reader, in escaping the Counterfeiter, to end up in the arms of the Reader. I will see to it that the Reader sets out on the trail of the Counterfeiter, hiding in some very distant country, so the Writer can remain alone with the young lady, the Other Reader. To be sure, without a female character, the Reader’s journey would lose liveliness: he must encounter some other woman on his way. Perhaps the Other Reader could have a sister…. Actually, it seems the Reader really is about to leave. He will take with him On the carpet of leaves illuminated by the moon by Takakumi Ikoka, to read on his journey. The breadth of the visual field and the auditory field allows the simultaneous recording of a much richer and more complex whole. The reader’s receptivity with respect to the collection of sensations that the novel wants to direct at him is found to be much reduced, first by the fact that his often hasty and absent reading does not catch or neglects a certain number of signals and intentions actually contained in the text, and second because there is always something essential that remains outside the written sentence; indeed, the things that the novel does not say are necessarily more numerous than those it does say, and only a special halo around what is written can give the illusion that you are reading also what is unwritten. You fasten your seatbelt. The plane is landing. To fly is the opposite of traveling: you cross a gap in space, you vanish into the void, you accept not being in any place for a duration that is itself a kind of void in time; then you reappear, in a place and in a moment with no relation to the where and the when in which you vanished. He was the sort of man who, no matter what he had won during the night, had already lost it at dawn. As long as I know there exists in the world someone who does tricks only for the love of the trick, as long as I know there is a woman who loves reading for reading’s sake, I can convince myself that the world continues…. And every evening I, too, abandon myself to reading, like that distant unknown woman.. The world is so complicated, tangled, and overloaded that to see into it with any clarity you must prune and prune. I keep meeting people the sight of whom, for various reasons, is unpleasant to me: my superiors, because they remind me of my inferior position; my inferiors, because I hate to feel possessed of an authority I consider petty, as petty as the envy, servility, and bitterness it inspires. You crane your neck to left and right, to peek at the others’ books. Who knows? One of these people may be reading one of the books you are looking for. This is why my attention, in contrast to what you, sir, were saying, cannot be detached from the written lines even for an instant. I must not be distracted if I do not wish to miss some valuable clue. Every time I come upon one of these clumps of meaning I must go on digging around to see if the nugget extends into a vein. This is why my reading has no end: I read and reread, each urne seeking the confirmation of a new discovery among the folds of the sentences. In my readings I do nothing but seek that book read in my childhood, but what I remember of it is too little to enable me to find it again. This entry was posted in Already read it, Italian literature.